Editor’s note: This adventure happened in 2012. I found it by accident in a neglected folder. The feelings I experienced that day were too transformational to keep hidden away in some dusty folder so I’m publishing this belatedly. P.S. Brian and I are no longer together but we’re still friends. 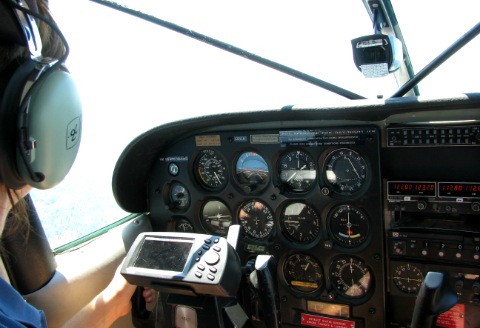 I’VE NEVER RELISHED being trapped inside a small plane at a dizzy altitude. 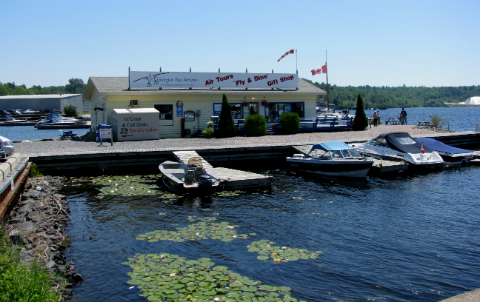 So I had no intention of taking the float plane ride during our one afternoon in Parry Sound, Ontario, Canada. Besides, it wasn’t in our budget. At approximately $120 per person (now $152 per person), it was justifiably out of our reach. Good. That would take the focus off me as the party pooper. Because I knew Brian wanted to go. I could feel his longing. 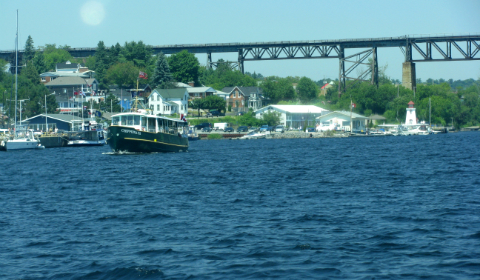 We strolled the hilly streets of Parry Sound, eating ice cream and browsing in bookstores. It was a weekday and things were pretty dull, even for a non-Xtreme adventure gal like myself. 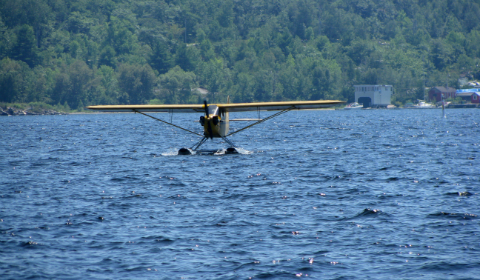 When we got down to the water, we found a picnic table where we could watch the float planes take off. That’s when things started getting weird. Whenever another one took off, my apparently deeply buried desire to try it intensified. My heart lifted and soared with every take-off. It didn’t take much arm-twisting. Soon we were in the office discussing our flight options with the friendly booking crew of Georgian Bay Airways. 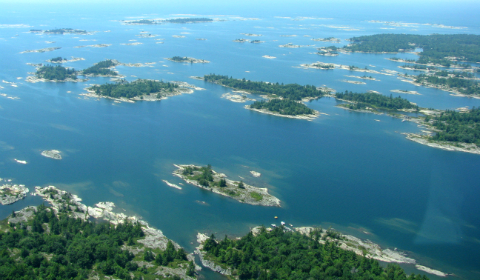 We looked over the menu and there was no contest: we wanted to do the 30,000 Island Tour. Paid up and ticketed, we had to wait until our pilot returned from her current 25-minute flight over the islands. The wait dragged on forever, partly from nerves, partly from sheer desire to get going. 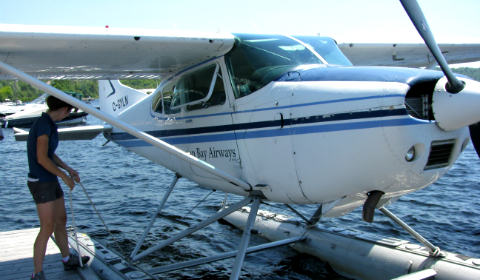 Finally, our plane taxied up to the dock and I saw our pilot climb down. She looked about nineteen years old. Slight build, not a commanding presence, just a nice girl. Egad. They must be hard up for pilots out here in the bush!! But there was no looking back. I immediately felt comfortable with Anne-Marie of the romantic French last name. With her steady, reassuring personality she answered my questions openly, sharing the dream that enticed her to become a pilot. 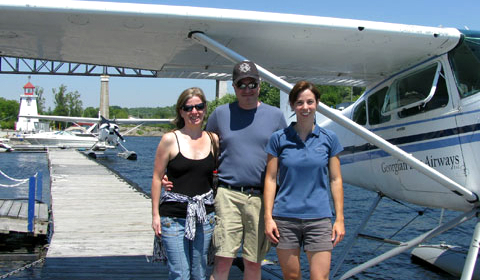 Float plane pilot for Georgian Bay Airways was a summer job for Anne-Marie as she studied for her Bachelor of Science in Nursing. I opted for the back seat so Brian could take videos from the air. Even in the back seat, and despite the wind causing lots of chop on the water, Anne-Marie’s take-off was relatively smooth. Just bumpy enough to be thrilling. As soon as we took off, I wanted to do it again so I could relive the feeling. 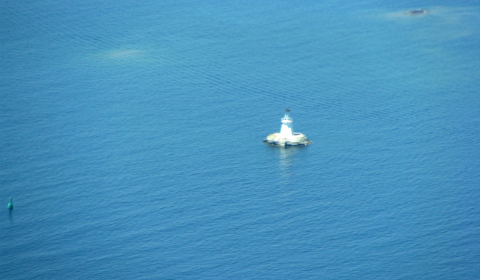 But we were quickly absorbed in watching the living map of islands and water unfold beneath us. 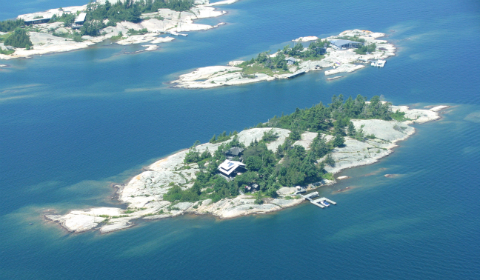 30,000 Islands in the summer sunshine, from the air, was worth every penny of our budget-breaker. 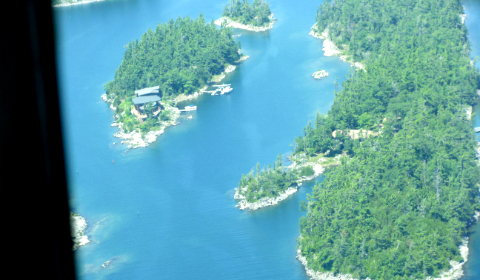 Being a writer I was fascinated by imagining the lives of those who inhabit the houses dotting the islands. Everything from summer mansions to family cabins to rustic living. Even a few swimming pools. 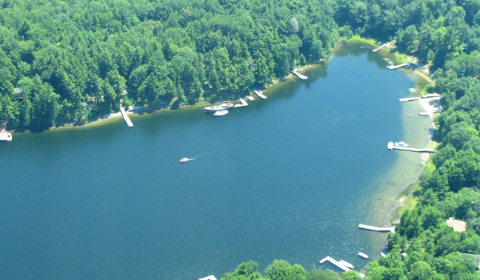 It was fun to speculate about a trip to town for supplies: the range of watercraft was impressive. By now I’d completely forgotten my first reaction to Anne-Marie as “not mature enough” to entrust my life to in a teensy plane. She clearly knew what she was doing, I never had a moment of fear and I could sense her quiet enjoyment. The only bad thing about the journey was the return. Anne-Marie’s landing was superb—but I didn’t want it to be over. I didn’t want to go back to my normal life. I wanted that glorious feeling more, more, more. Anne-Marie turned to me with a grin, her young face framed in headphones. Milli Thornton (aka Milliver) is the author of Fear of Writing: putting the fun back into writing. She is owner of the Fear of Writing Online Course and she coaches writers and closet writers at Write More Words. LOVE this story, Milli! The views are stunning, and it sound like such a wonderful adventure. I’m the same way, trying to stick to budgets and sometimes I regret not opting for certain things. I’m so happy you stretched the budget for it – but I understand completely your first reaction to it. Thank you for reading, Estrella! I had fun reliving the experience through the pix and the story I wrote about 6 years ago. 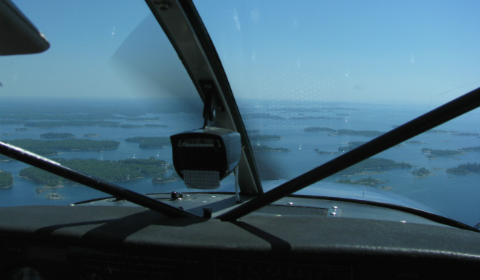 If you ever get a chance to fly on a float plane, DO IT!! There’s no other feeling quite like it (even though I normally fear and hate small planes).